Again, how many paragraphs or pages is that worth? Notice the spectrum here. Still Ginsburg and Souter on the left end. But on the right it's now Thomas and Scalia. Not Alito. 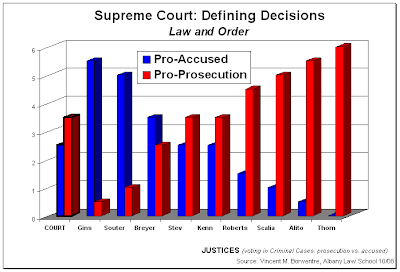 Although his record in the defining criminal cases put him to the far right because his voting is among the most pro-prosecution within the Court, his overall voting record is less conservative. This is largely because of his record in the discrimination cases which, as we have previously seen, placed him with the Court's liberals. 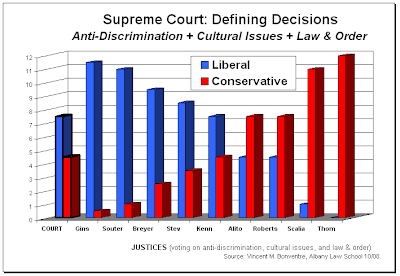 So when all these defining decisions are taken together, Thomas and Scalia--as Court watchers would expect--are at the far right end of the Court's spectrum. Alito, like Roberts, has a conservative voting record. But it is not as ideologically lopsided, absolute, rigid, consistent, reliable, faithful--or whatever characterization one might prefer, depending on whatever sort of ideological judging one might prefer. Anyhow, more on the voting records and the Court's spectrum in the next post in this series. It will take a look at selected "defining" cases in which aspects of the political process were challenged. And, of course, the cases are ideologically charged.